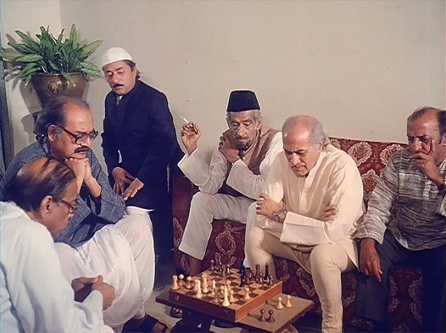 Ramesh (Farooq Shaikh) lives with his aging widower father Kailashnath (Utpal Dutt). Kailash is horrified by the girls he sees in his search for Ramesh’s bride: they lack traditional values, and speak English, and won’t be the kind of bahu that he wants. Ramesh works for Omprakash (SN Banerjee). Omprakash has just promoted Ramesh to General Manager of the company and is ready to semi-retire in Poona. His niece, Ramola (Deepti Naval) has just arrived from Delhi. She is a doctor educated abroad, and after a bit of a rough start she and Ramesh have fallen in love. But what can they do about Kailashnath and his acute dislike of “modern” women? Kailash has the cutest circle of friends you’ve ever seen. One of them, Lala (Saeed Jaffrey) is very close to Ramesh as well, and agrees to help him gain his father’s approval of Ramola. His plan: pass off Ramola as a traditional village girl with little education (and no English!). They rope in her uncle to help out and the stage is set. Lalaji tells Kailash that he has found the perfect girl for Ramesh and takes him to an out of the way village, where Ramola and Omprakash (disguised as the village pandit) are waiting. Ramola plays her part to perfection. Kailash is enchanted with her and immediately arranges the marriage. The wedding takes place and soon Ramola has become a beloved part of the household. I want to live there too! Ramola has reservations about the deception, and feels guilty about lying to her father-in-law. It’s sometimes very difficult to keep up the pretence too, like when Kailash asks her to cook some food for his friends who are visiting. 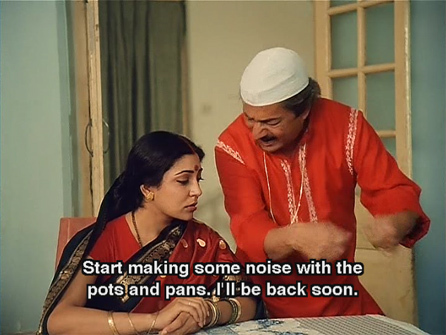 She has no idea how to cook, but Lalaji comes to the rescue. Then one day Kailash tells Ramesh to take her to her village so she can visit her uncle. At the same time, Omprakash (now living in Poona) decides to visit her, and disguises himself again as the deaf village pandit. Hilarity ensues as Ramesh and Ramola (who have taken the opportunity for a short honeymoon, instead of visiting her fictional village home) and Omprakash must somehow save the situation from unravelling—especially when Kailash decides to accompany Omprakash “home” because he’s missing his daughter-in-law! She tells him that she’s very happy, but takes the opportunity to sound him out about his abhorrence of English-speaking modern women. His response disheartens her; he says that he feels the emphasis on speaking English is eroding India’s traditions and values—it’s the result of 200 years of slavery. She tells Ramesh that she fears Kailash will never accept her as she really is. Ramesh pleads with her to keep pretending for a while. He is sure that once his father loves and depends on her, he will forgive them when they confess all. I think he’s also kind of a wimp when he comes to his father! In any case, as the months go on, she becomes more and more fond of Kailash—and he of her—which of course only makes her feel worse. But then Kailash has a heart attack, and the only person who can help him in time is Ramola—the doctor. What should she do? Can Kailash ever accept her? Do watch to find out. I’ve left out many little things that all add up to a heartwarming, funny, sweet film. It’s classic Hrishikesh Mukherjee! 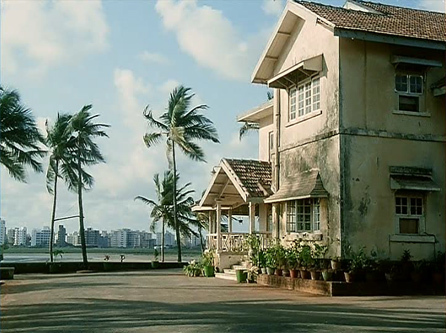 Posted on May 7, 2008 at 11:40 am in Hindi movies	| RSS feed You can skip to the end and leave a reply. I do beleive I havent seen this, and I absolutely need to! What a totally adorable movie! 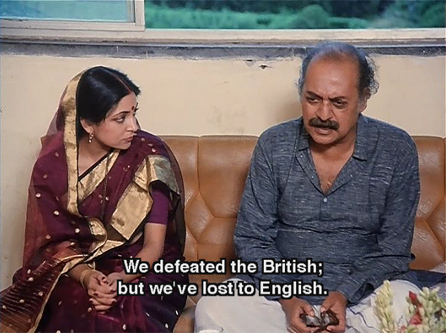 I love Saeed Jaffery in everything (even when he gets villanous), as much as I love Utpal Dutt. Oh I’d forgotten this! 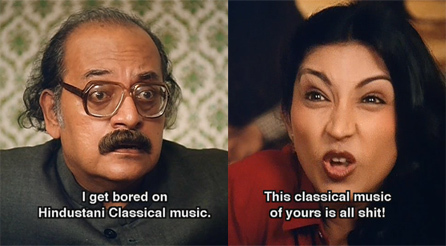 I love the Deepti Naval-Farouq Sheikh combo – they made such a cute couple in every movie they’ve been in! This was a really good one. The romance between Deepti and Farooq was hilarious – like everything else in the movie! Farooq Shaikh had some really great comedies. Have you seen his ‘Yahan Vahan’ which co-stars Surinder Kaur? I have not seen nearly enough of Farooq Shaikh—just this and Umrao Jaan. But he’s in a lot of films that I still want to see—so keep the recommendations coming! memsaab, try the Naseer-Deepti-Farooq starrer “Katha”. i think you’ll like it..
200 years of slavery? I thought it was less than a hundred years? Anon–Depends on when you start counting, I guess! You have to watch farooq’s “Chashme Baddoor”- its as happy as this one, and preceded this by a few years. Also try “Saath Saath.” absolutely brilliant. I’ve been looking for Chashme Buddoor for a while, but haven’t been able to find it yet…will keep looking, and also for Saath Saath. Thanks!!! I saw this movie in the 80s and still remember many of the scenes. Absolutely love it. 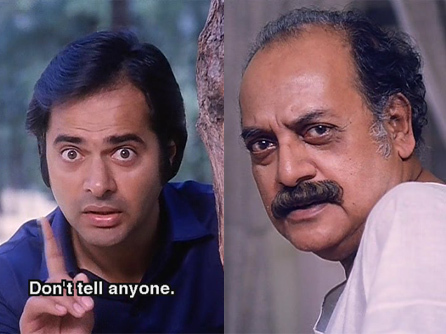 Both Farooq Sheikh and Utpal Dutt are a hoot, and I love the small role played by Saeed Jaffrey, especially when FS comes to him for advice – that scene is etched in my memory: when FS is shocked that SJ would suggest that he got a girl pregnant and says paraphrasing “I can’t do such a thing!”, and SJ gives him a knowing smile and says “Yes, you can.” Brilliant!!! I’d suggest “Katha” and “Chashme-Bud-door” if you haven’t seen them already. 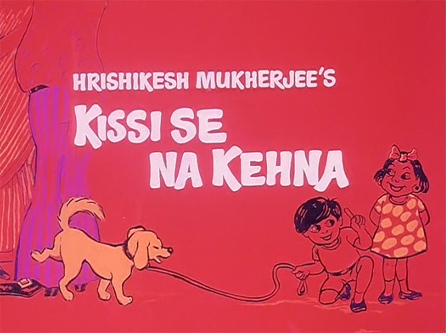 Great to have another Hrishikesh Mukherjee movie to look for. Cheshme Bud-door is brilliant, and has pretty much the same cast along with some other people. It includes some delightful film parody, too. 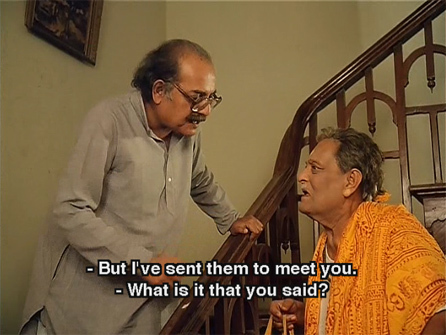 And yes, Saeed Jaffrey was absolutely hilarious in this. kailash’s circle of friends is like a snip of Bharat Ekta docus form the 80s. just luv them! Anonymous: If you take the Battle of Plassey (23 June 1757; palashi is the indian name) as the start of British rule in India, it is around 190 years. it looks like h. mukherjee became quite repititious in his old age. 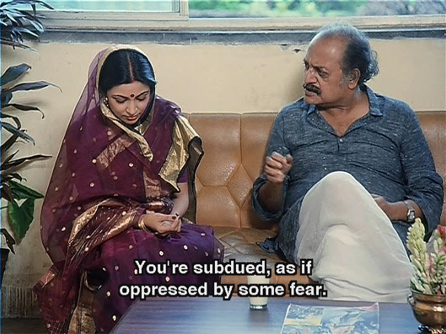 you find deepti naval curing and caring for utpal dutt just like rekha did it for dina phatak in khubsoorat. utpal dutt not liking certian kind of person: men without mouche in golmaal, here “westernised” women. 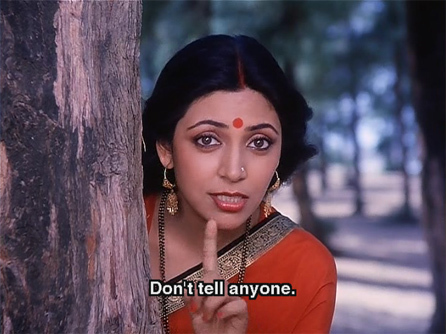 people “impersonating” other characters: seen in chupke chupke, golmaal. but even then his movies were great see. saw the movie today. made a nice watch. Must warn you, I watched the movies sometime in mid 80s on Doordarshan. Found them hilarious at that time. Have fond memories of them. But as you might be realised yourself, old memories revisisted leave sometimes a bitter taste behind. Film dekhne ke baad dil ne kaha,ab aisi film kabhi nahin banegi….!!!!! !